Customers often ask us, rather nervously, if we celebrate Christmas. And the answer is of course we do. With tinsel-coated knobs on. We actually celebrate anything that’s going, as it’s good to be jolly and there are enough things to be sad about in the world. And as we’ve just celebrated our 10th birthday, we’re pretty much going to be partying all month anyway. In Iran the big thing is Shab-e-Yalda, which is the Winter Solstice – the longest night. On this night in Iran it is believed that all manner of ghouls walk the earth, and so traditionally Iranians stay up all night, chattering loudly and burning candles and lanterns to scare the bad things away. 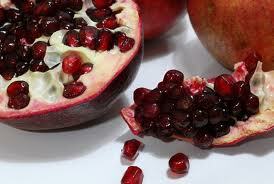 They also eat a lot of pomegranates, which is the quintessential fruit of Winter (remember Persephone). But they also celebrate Christmas, which even Muslims recognise as the birthday of Jesus.